Australia Officially Inducted Into IFA! 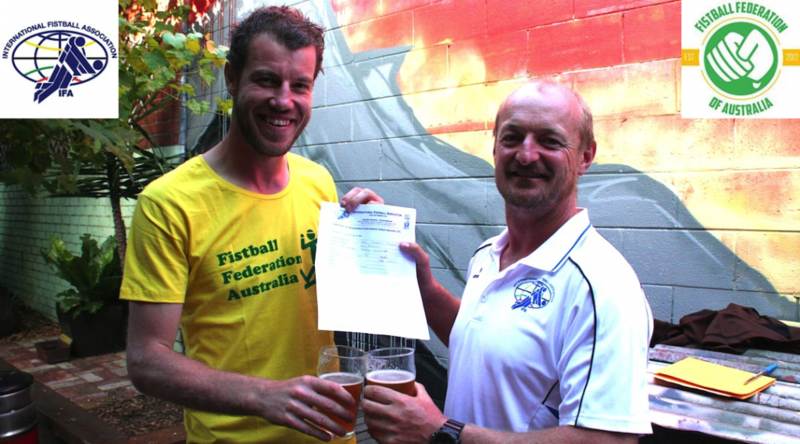 For those that were unaware, the visit by IFA official Klemens Kronsteiner for fistball training also doubled as an opportunity for the Fistball Federation of Australia to be officially inducted into the International Fistball Association! As a result, fistball is now officially recognised as being played in 6 continents across the world (attempts to push fistball into Antarctica so far have been fruitless, and cold)! In addition, FiFA is now recognised as the sole organisation responsible for organising fistball in Australia on a national scale, including sanctioning of internal tournaments and choosing national squads to represent Australia in international competitions. Naturally, the official induction occurred at the pub, and while the ritual for the cameras was very official and civilised, it is rumoured that Klemens and FiFA President Rolf “Godfister” Petersen shuffled into the shadows afterwards to draw blood from their fists and chant the sacred fist oath in unison. « Inaugural FiFA Coaching Weekend Success! » Sportaroo Fundraising Campaign Kicks Off!